Me in front of the Roopkund lake. Seats will be confirmed only on advance payment of RS 4000. Rest on arrival in cash preffered. Cost inclusive : All accomodation in homestay or tents from lohajung to lohajung , sleeping bags and best quality equipments, guide fees , portar fees, simple nutritious veg food , trek permits. Cost excludes : transport till lohajung has to be shared among the trekkers if we decide to arrange the pick up for their ease. Any personal expenses such as extra meals or personal Porter for personal luggage. Grade : Moderate Difficult , Disclaimer mandatory. 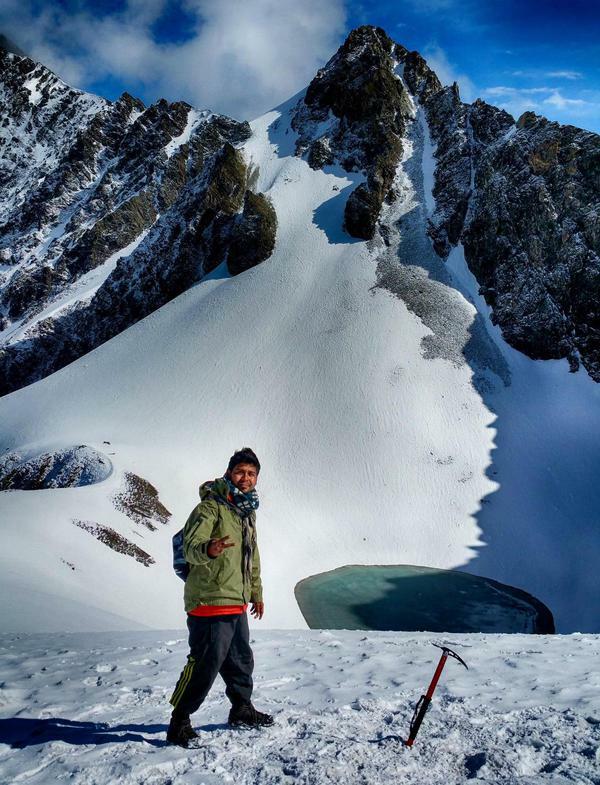 Roopkund is yet the country’s most popular trek and ranks 3rd in the best trek of INDIA. The lake of mystery hidden in the high reach of the Himalayas is guarded by the giants NANDA GHUNTI & TRISHUL , far from the civilised world. The lake hides in it the mystery of giant human skulls and bones , which is often seen when we finally reach its abode. Legend has it an entire army was abolished on those heights of 16,500 ft which resulted in the skulls and bones present on the lake. Danger is very real , but fear is your choice. Join me if you think you have it in you to decipher the mystery. How to reach dehradun or kathgodam : Abundant buses and trains from delhi. Both kathgodam and dehradun have railway connections from round the country see if it has a direct train from your nearest rail head. Kathgodam is sligtly closer to lohajung than dehradun. But your choice. Dates : 28 Sept - 3 Oct.
Day 1: Pick up from kathgodam / Dehradun Railway station at 7.00 am. Drive to Lohajung base camp. Approximate arrival time at Lohajung 6-7 pm. Day 2: Trek starts. Lohajung to Didina. Homestay at Didina. Day 3: Didina to Bedni Bugyal (via Ali Bugyal). Day 4: Bedni Bugyal to Bhagwabasa. Day 5: Bhagwabasa to Roopkund and back to Patar Nachauni. Day 6: Patar Nachauni to Lohajung via wan. Day 7: Depart for Dehradun. Approximate arrival time at dehradun: 6 - 7 pm. When you are traveling with me , you are choosing to help a nomad to live on road and earn his bread. 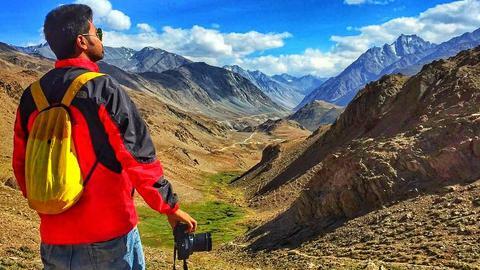 Though a nomad , I am not a novice , I am premier tour and trek guide having worked with National Geographic , G adventures and organisations such as that. I am a individual guide , not an agency or company, just working with locals who are my family as they provide me food and shelter in lieu of the business I bring to them. When you choose me, you also choose to directly help the locals and send there little himalayan kids to school and buy new clothes, not adding up to the wealth of a established corporation. Choice is yours.